The TOGAF Architectural Development Method (ADM) is a flexible method for developing enterprise architectures. In this video, Mike from Good e-Learning discusses Phase A: Architecture Vision. To learn more about the TOGAF framework and pursue your TOGAF certification, contact Good e-Learning today! The TOGAF Architecture Development Method (ADM) has remained at the core of the enterprise architecture framework for nearly 25 years. It offers a succinct yet flexible roadmap for developing enterprise architectures, allowing different users to adapt it based on their architecture development goals, industry, company size and more. In this video, Mike from Good e-Learning discusses Phase A of the TOGAF ADM: Architecture Vision. Put simply, this stage revolves around creating a clear vision of a proposed enterprise architecture, which will then drive development going forward. Not only will the phase establish the work required in order to create the proposed architecture, but it will also define the business value which the architecture will deliver, along with the desired capabilities. Good e-Learning is an award-winning provider of online courses on topics like TOGAF, ITIL, Six Sigma and Lean. Each of our TOGAF enterprise architecture courses has been accredited by The Open Group, the organization behind the TOGAF framework. We even won the ‘Outstanding Certification Product’ prize at The Open Group Awards in 2018. No matter what stage you are at with your TOGAF certification, we have a course to suit you. The TOGAF Awareness course provides a simple introduction to the TOGAF framework, ideal for students who require a basic understanding of it for their job, or those who are considering whether or not to pursue a TOGAF qualification. 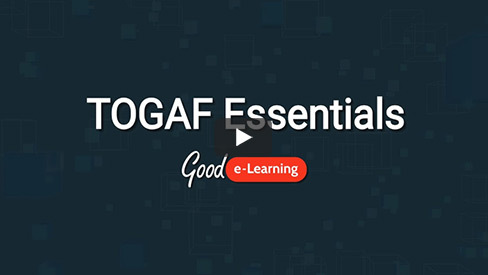 The TOGAF Certification course offers the best route to becoming TOGAF-certified (they even come packaged with FREE exam vouchers and 24/7 tutor support). Those who are already certified in TOGAF 9.1 can take our TOGAF Essentials 2018 course to update their certification to TOGAF 9.2. The TOGAF 9.2 Certification & ArchiMate 3 Practitioner Suite can upskill students not only in the TOGAF framework, but also the ArchiMate modeling language - an invaluable tool for budding enterprise architects! Interested in finding out more? Browse our full portfolio of Business & IT courses or visit our FREE downloads area for a wide range of posters, whitepapers, case studies and more from leading industry experts.